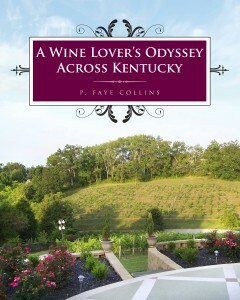 Visitors to the KentuckyWineLover know about the new book I’ve been working on for the last few months. The last couple of months have been hectic with lots of experimentation and cooking with wine. Denise Nelson and I have been working on the book and trying out recipes and making decisions about what we want to include. Hopefully, we’ll have some news soon about what’s included and when you can expect a release. After a purchase of mixed wheat, tomato, and spinach shells, I decided to experiment with creating my own recipe for the stuffing and the sauce. Hope you enjoy the results. We did! Pre-cook a pound of crumbled sweet Italian sausage. Cook the shells as directed on the package. Set aside while you are mixing the filling. Combine ingredients for the sauce in a large saucepan and cook over medium heat for 20 minutes. Fill the cooked shells with the stuffing and place in a 9 x 13 baking dish. Cover with sauce. Cover and bake for 30 minutes. This is a slight variation on one of my favorite meat dishes. It was a big hit with my husband. Hope you enjoy it. Pour olive oil in a large skillet. Place steak, onion, mushrooms and spices in the olive oil and cook until the meat is done and the vegetables are tender. Add basil leaves, tomatoes, wine, balsamic vinegar to the skillet. Simmer for 10 minutes. Prepare the fettuccini as directed on the packaging. Drain. Pour the pasta into the skillet and blend. Simmer for four minutes. Serve while still hot. In a shallow glass baking dish, combine the wine, oregano, sea salt, and pepper, add the chicken and cover. Place in the refrigerator to marinade for 2 & 1/2 hours. When ready to cook, mix parmesan cheese and spinach flakes in a small bowl. Cover the bottom of a 9 x 13 baking dish with olive oil. Remove chicken from marinade and bread with the parmesan and spinach mixture, and place in the baking dish making sure that the pieces are not touching. Bake at 350 degrees for 1 hour. Most of the ingredients in the recipe are from Kentucky. The spinach flakes, the Mediterranean oregano, and the Tellicherry black pepper were purchased from Colonel De’s Gourmet Herbs and Spices, at the Friendly Market, in Boone County. The Pinot Grigio was from Elk Creek Vineyards and Winery. The olive oil was from Stuarto’s in Lexington. Recently, I heard someone ask for the cheapest wine because they were just cooking with it. When using wine for cooking, I suggest you always use a wine that you would enjoy drinking. A cheap wine that you wouldn’t consider drinking is not going to taste any better in your recipe. You want your food to be enjoyable, so use a wine you would enjoy as well. While you don’t necessarily want to use the most expensive, special wine you’re saving for a special occasion, you do want a wine that you would enjoy drinking with that dinner. When following a recipe, most white or red wines could be exchanged. If you prefer the taste of Cabernet Sauvignon to Merlot, changing the wine will only enhance the flavor that you enjoy most. For instance, in my Wine Cake recipe, I have used several different reds. The flavors change somewhat, but they’ve all be delicious. Have fun experimenting when cooking and remember what doesn’t go in the recipe should be enjoyed by the cook while preparing that favorite dish. For quite some time, I’ve wanted to try a roast beef dish with one of Kentucky’s fine red wines; but couldn’t make up my mind about the herbs. This weekend when I was looking at my spices, I found my sage and rosemary next to one another and immediately thought of the Simon and Garfunkel hit song Scarborough Faire – “parsley, sage, rosemary, and thyme”. It seemed an omen. This is the recipe for my dish. By the way, my husband loved it and made sure I wrote it down. With most of my recipes, I try to use Kentucky products. In this dish, the shoulder roast was Kentucky Red Angus from our own farm. The Norton wine was from Horseshoe Bend Vineyard and Winery. Mix together the spices, and set aside. Place the shoulder roast in a roasting pan; rub spices into the meat. Pour in wine, beef bouillon, and water. Cook covered, slowly in a 300 degree oven, for 3 and 1/2 hours. Add mushrooms and cook uncovered for ½ hours (or until mushrooms are tender). Remove meat and mushrooms from the liquid and place on a meat platter. To make gravy, add 1 and ½ T. of corn starch, bring to a boil, and cook over medium to high until it reaches the desired consistency. If you prefer, leave out the cornstarch and let liquid boil it over medium heat until reduced. Pour either gravy or juice over the meat & mushrooms. Last fall, we visited Lavender Hills, in Augusta, and I bought some lavender for cooking. If you’ve never visited there, I recommend it. We enjoyed the experience a lot; it’s a lovely place and their products are really nice. Deciding what to make with the lavender wasn’t easy. Having some extra time, without classes to teach, I started experimenting. The results were very good and I think you might like to try it yourself. Trim fat from the chops and cut each into two pieces, place in a 4 x 6″ baking dish. Mix remaining ingredients and pour over pork chops. Cover and bake at 350 degrees for 1 hour. Uncover and continue baking at 425 degrees for 15 minutes. On New Year’s Day, I was preparing dinner for friends and decided to experiment with a chicken dish. It turned out to be delicious so I’m sharing it with you. Brown the chicken pieces in the olive oil. When browned, place in a 9 x 13 baking dish with the onions and mushrooms on top. Using the olive oil remaining in the skillet, add the balsamic vinegar and the spices. Stir the wine into this mixture. Pour over the chicken and vegetables. Bake at 350 degrees for 1 hour and 45 minutes. Check while cooking to be sure that the chicken does not get too dry. As with most of my dishes recently, I have tried to use Kentucky products. I used the Traditional 18-year aged Balsamic Vinegar and the Tuscan Herb EVOO from Lexington’s Stuarto’s Olive Oil Company. My spices are from a company named Litehouse, which sells freeze dried herbs (available at Krogers). The wine in this is Pinot Grigio, like that offered by the Grimes Mill Winery in Lexington. Hope you enjoy this dish as much as we did. Anyone growing up in rural Kentucky will have memories of picking blackberries, or of drying black walnuts to crack in the fall. Most Kentuckians have always put those memories in the closets of our minds of times with our grandmothers and cherish each and everyone. I decided to create a cake that would tie those memories of my childhood with my love of wine. Hope you enjoy it as well. I combined some of the best ingredients from a number of jam cake recipes and added some of my own. Cream together 1 cup of slightly melted butter and 2 cups of sugar, add 4 eggs. In a separate bowl, mix together 2 and 1/2 cups of flour and 1 teaspoon of baking soda. Add the dry ingredients to the butter, sugar, and eggs mixture gradually alternating with 1 cup of Walnut Ridge Wine (from Millanova in Bullitt County, KY). Mix, then add the following spices: 1 t. vanilla, 1 t. nutmeg, 1 t. ground cloves, 1 t. cinnamon, 1/2 t. ground ginger, and 1 t. allspice. Blend in 1 cup of seedless blackberry jam. (I used jam made by Sunflower Sundries, Mt. Olivet, KY.) Add 1 cup of black walnuts. (Mine were purchased at the Kountry Kupboard in Harrodsburg, KY.) I recommend a bundt pan. Bake at 325 degrees F. for 1 hour in a greased and floured pan. 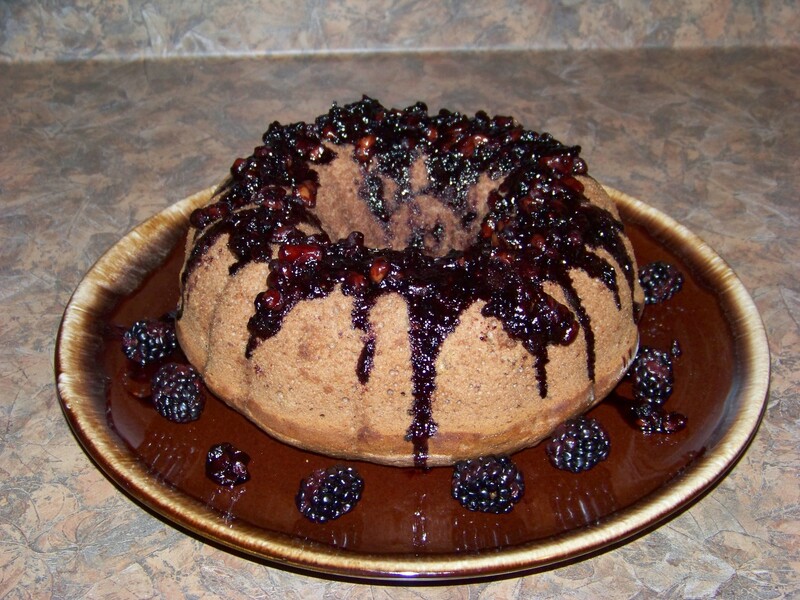 For a glaze, stir together 1/2 cup fresh blackberries, 1/2 cup black walnuts, and 1 cup of blackberry wine (I used the Blackberry from Chrisman Mill, Nicholasville, KY.), reduce until the liquid is somewhat thick. Pour over the cake. Arrange a few fresh blackberries on the plate. You might also want to serve it with ice cream or with a sauce. I served it without those, and it was a hit. Slice the pork tenderloin into 1/2 inch slices, cut each slice in the center to make medallions. Put medallions into skillet with olive oil. Season with Coarse Ground Black Pepper and Sea Salt. Brown both sides. Remove and place in a 9 x 13 casserole dish. In a bowl, mix the remaining ingredients. Pour over the medallions. Bake at 375 for two hours. Remove foil and bake for 15 minutes. After having pork medallions at several restaurants over the years, I began experimenting with herbs and amounts. This is the recipe that has been the most successful. I’ve used different types of wine, from Merlot to Cabernet Sauvignon. The last time I served this I used a blended red table wine from CCC Trail Vineyards in Morehead and Traditional 18 year aged Balsamic Vinegar from Stuarto’s Olive Oil Company in Lexington.